I don’t seem to be able to go to the store lately without picking up another bottle or two. In fact, minutes after that photo up there was taken, I purchased 2 more bottles from that very display of lovely Sinful Colors! And on top of that there have been freebies like the one I received from Influenster for testing purposes. My nail polish drawer overfloweth. My plan is to purchase a spice rack to mount on my wall for storage. It will make it a lot easier to see what I have and get at it (aforementioned drawer is a bit hard to open and close sometimes.) Hopefully that will happen later this week. I’m looking forward to it for two reasons. 1. organization! and 2. I recently got a new drill because I still haven’t found the one I already own. I think it got misplaced in the move. So I get to test that out! 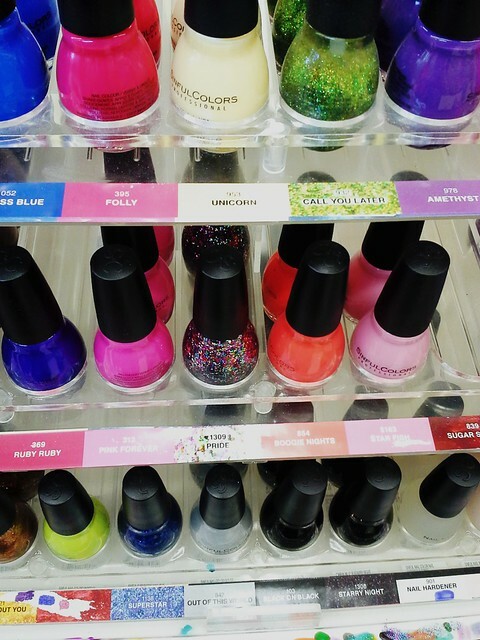 If you want to score some lovely Sinful Colors of your own, you can find some pretty good selection at Walgreens, where the above photo was taken. This entry was posted in nails and tagged influenster, nail polish, nails, sinful colors, vox box.